NOTE: There is no need to download/print the ActBlue tickets. We will have all the ticket information at the door at registration. 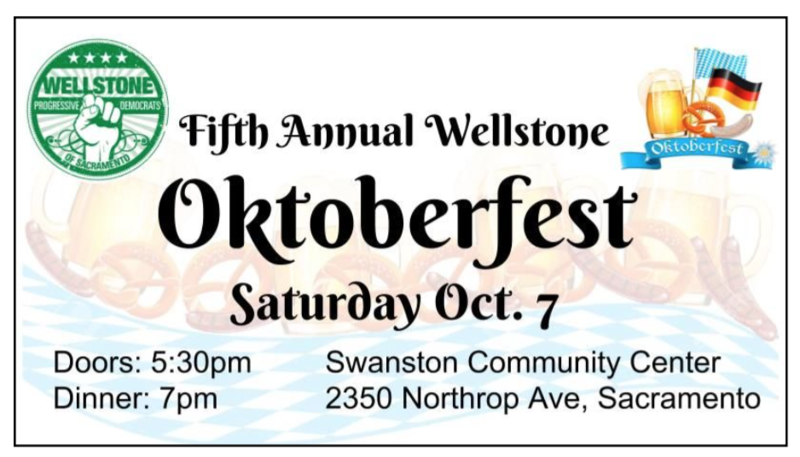 The Wellstone Progressive Democrats of Sacramento welcome you to our fifth annual Oktoberfest on Saturday, October 7th, 2017! Best of all, the evening features the good company of our progressive community. We stand for the principles for which the late Senator Paul Wellstone was best known: his compassion, his perseverance, and his fights for a broad range of social justice issues, including workers’ rights, anti-war efforts, protecting the environment, expanding healthcare and mental health, stopping domestic violence, and pushing for progressive immigration policies. 12 dinner tickets & 12 drinks; listing on event signs as a main sponsor; acknowledgement on flyers, social media, and emails; recognition by the MC. 8 dinner tickets & 8 drinks; listing on event signs as a main sponsor; acknowledgement on flyers, social media, and emails; recognition by the MC. 6 dinner tickets & 6 drinks; listing on event signs as a sponsor; acknowledgement on flyers, social media, and emails; recognition by the MC. 4 dinner tickets & 4 drinks; listing on event signs as a sponsor; acknowledgement on flyers, social media, and emails; recognition by the MC. 2 dinner tickets & 2 drinks; listing on event signs as a sponsor; acknowledgement on flyers, social media, and emails; recognition by the MC. For sponsorships, contact Phillip Kim at 301-518-2631, phillipkim@gmail.com, or send checks, payable to Wellstone Progressive Democrats of Sacramento, to 1033 S Street, Suite 200, Sacramento 95811. Please indicate your dinner choice.